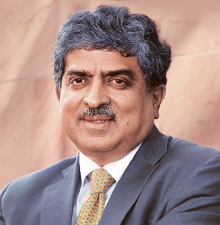 Nandan Nilekani is the chairman of EkStep, a non-profit literacy and numeracy platform. EkStep looks at solving the 'learning problem' by creating a technology-led platform to help children in improving their learning outcomes. Prior to this, he was the Chairman of the Unique Identification Authority of India (UIDAI), with the rank of a Cabinet Minister. As the chair of the UIDAI, he was responsible for implementing the Unique Identity card project in India. This initiative aims to provide a unique identification number for all residents of India, to be used primarily as the basis for delivery of welfare services. He also headed the Government of India’s technology committee, TAGUP, after his successful stint at Infosys. Nilekani was the Co-Chairman, Infosys Technologies Limited, which he co-founded in 1981. He was the CEO of Infosys from 2002 to 2007. Born in Bengaluru, Nilekani received his Bachelor’s degree from Indian Institute of Technology, Bombay. In 2006, he was awarded the Padma Bhushan. He was also named Businessman of the Year by Forbes Asia. Time magazine listed him as one of the 100 most influential people in the world in 2006 & 2009. He is the author of “Imagining India” and co-authored his second book with Viral Shah: “Rebooting India: Realizing a Billion Aspiration”. Foreign Policy magazine listed him as one of the Top 100 Global Thinkers in 2010. He won The Economist Social & Economic Innovation Award for his leadership of India’s UID initiative in 2014.